thanks uncle lynn and anonymous (mr. stinky pants) for responding to my last question about being a contemporary of Jesus. now i have another for you… what is love? (no need to do the SNL side head bop, thanks). last night marked my final two classes of the philosophy and theology segment at st. john’s. 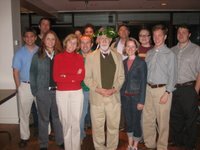 for many weeks now, my preceptorial class (pictured) has discussed love in the context of plato’s dialogues, the Bible, poetry, etc. i enjoyed the discussion thoroughly, and the company too. 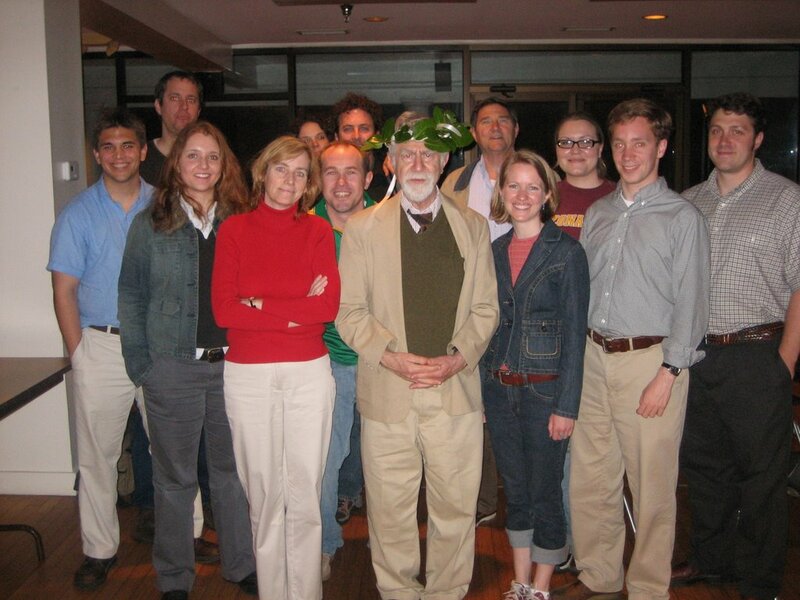 note mr. kutler’s garland laced with ribbons… reminiscent of the drunken alcibides crowning socrates in symposium. Biologically, love is a chemical/hormonal reaction intended to produce the psychotropic impact necessitated to drive the:a) reproductive health of the speciesb) maternal care of humanity’s relatively invalid offspringc) paternal involvement in the relatively long term care of the offspring…because otherwise why should he stick around? Some bugs kill the male and use him for food, that’s how useful he is biologically.From a religious standpoint, love is a “shadow or type”, giving an example for God’s love for Israel, Christ’s love for the church, etc. In the same way that the seasons are metaphorically linked to the ideas of sin and rebirth, understanding the divine idea of love (even if we’ve corrupted it) is invaluable in our understanding of God the Father. Really though, I have no idea. It’s at least something to do to keep from being bored.There, now we’re tied 1-1 on comments. Yours was about loins, however. Greek: eros, philia, agape. Italian: amoreFrench: amourSpanish: amor (I think)WHat is it about these languages that lends them more to speaking of love than english? Is it the languages themselves, that they have better tools for speaking of love, or is it more because of their traditions, and the authors who used them? Personally, I think it’s more the authors, than the languages. For example, it is something very special to read Dante in Italian, and the main subject of his work is love. It is not translatable, but I rather think that is because of his genius as a writer, rather than the limits of the english language. I can imagine that it would be similarly difficult to read “The Love Song of J. Alfred Prufrock” or “Paradise Lost” in translation… What is love? I rather think you are better equipped to answer that question than I am. But I’ll give you my version since you asked for it. Love is the reason why we are here, and it is the reason why we stay. It is what holds us together. It is bound up with hope and faith in a better world. It is what gives us life. It is where we came from, and it is where we are going. Without love we would be in deep trouble. that last comment had to be j. i don’t know anyone else who has read dante in italian. i don’t know why you’d think me to be better equipped to answer such a question. i’m young. and inexperienced, kinda. i at least have a great deal to learn still.but i also know that my heart is so full of love that i can hardly contain it. not romantic love (though i’m certainly a romantic) but just love for people. all kinds of people. and i think love is how i reflect God to people, and how God is reflected to me in the faces of those who love me. it’s radiant. it’s beautiful. I have a theory that love is a state of near perfect communication between two people. With our differences, our confusing similarities, our social constructs, and emotional barriers, we have countless things separating us as people and keeping us from truly communicating all that we feel. I think that the state of “love” is a state when two people align in such a way that many (if not all) of those barriers are circumvented and true, unfiltered communication of thought and emotion can take place. The euphoric feeling associated with love is the refreshing experience of truly understanding another person and being truly understood in return. Why should a refreshing experience of true understanding lead to a euphoric experience? What is the mechanism that leads to that ecstasy? Effect: euphoria and whatnot. Cause?